Wonderful World of Wool is the only level of Craft Island in Yoshi's Woolly World, and the final level in the game. It is unlocked after all two hundred seventy previous Smiley Flowers of all other levels are collected. The level begins with many windmills, along with a few Shy Guys, Piranha Plants, and Wild Ptooie Piranhas. It leads to a segment with wavy sand dunes and a few Hot Dogs. The next segment consists of rainbow platforms, along with many Hook Guys and Gusties. The segment after that features a raft with Cheep Cheeps, Lunge Fish, and Stalking Piranha Plants. The following segment features an upwards-moving ice block platform with Bumpties and more Piranha Plants. The next segment features Poochy moving in lava, along with Kamek and some Spinners. The following segment fires Yoshi up and over the Moon, where the segment after that drops Yoshi through a waterfall and back down to the ground, where Poochy awaits. If Yoshi hits a Winged Cloud while riding Poochy, an arrangement of beads unveils to spell "YOSHI". Afterwards, Yoshi and Poochy reach the Goal Ring. Smiley Flower 1: Moving in conjunction with the windmill at the end of the first segment. Smiley Flower 2: In a hidden Winged Cloud at the end of the sand dune segment, just to the right of the lower Hot Dog. Smiley Flower 3: Inside some sponge-dirt in the raft segment. Smiley Flower 4: Near the right wall in the ice block platform segment. If Yoshi is too far away, he can spit out a Bumpty at it to collect it. Smiley Flower 5: Automatically collected upon being shot over the Moon. Wonder Wool 1: In the middle of the sand dune segment, just above in plain sight. 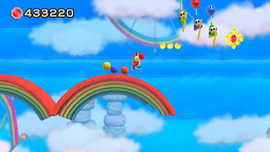 Wonder Wool 2: When reaching the top left side of the rainbow platform segment, Yoshi must allow two Hook Guys to pop many bubbles, revealing the Wonder Wool. Wonder Wool 3: At the end of the raft segment, at the end of the longest rope. Wonder Wool 4: Just after the first Spinner, Yoshi must guide Poochy to an alcove containing the Wonder Wool. Wonder Wool 5: Near the end of the trail of beads through the waterfall segment. Collecting all of the Wonder Wools knits Shiny Platinum Yoshi back together. Each of the first six segments of the level are made to resemble a world of the game, encountered in the same order as the worlds themselves.